Kravitz’s 1998 hit, Fly Away, was released again in New York City (NYC) on Thursday at the eccentric Public Hotels to an audience of international and local media. This is the first time in six years that MOT has released a brand new campaign, according to Dionisio D’Aguilar, Minister of Tourism and Aviation. “If you don’t refresh, reinvigorate and re-launch then the product becomes stale and people wonder why should I go back there,” the tourism minister said. 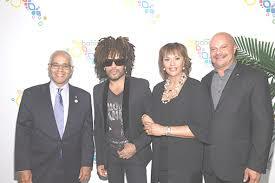 D’Aguilar said his ministry saw Kravitz, and one of his most successful tunes, ‘Fly Away,’ as a perfect fit. The tourism minister, while shying away from providing an exact price tag on the new venture, assured that the project was comfortably executed within MOT’s annual budget of $20 million allocated for marketing spend. The Fly Away campaign features tourists and Kravitz enjoying clear blue waters, bonefishing, snorkelling and a number of other activities throughout various islands in The Bahamas. The campaign has also produced separate feature vignettes which highlight Bahamians on various islands who provide historic stories about what makes their island so special.